GLENDALE — The free throws kept coming and Glendale High School dropped in all but four in the fourth quarter en route to a 65-55 foul-fueled victory over visiting Pasadena in a Pacific League game on Friday night. Glendale made 20 of 24 free throws in the quarter to repel all of the late frenzied Pasadena rallies. Editor’s note: To the players, thanks for the memories and best of luck in the future! 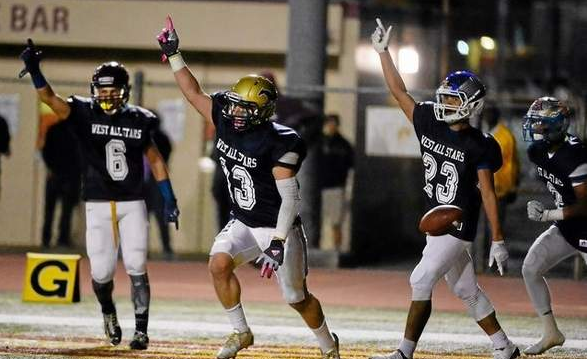 The tweak in geographic areas to pool talent from for the West team in the SGV Hall of Fame All-Star Game for high school football seniors paid big dividends on Friday night. The West ended a seven-game losing streak in the series with a 31-14 win over the East in the game’s 36th renewal. The East still leads the all-time series 23-11-2. With the West struggling in recent years, game organizers changed the borders used to pool talent from previously the 605 Freeway to now Azusa Ave. The game was also moved from late spring/early summer to January in an effort to help players get some last-minute recruiting attention before signing day next week. The West held up much better in the trenches than in year’s past and that’s all its offense needed to put up big numbers. Maranatha quarterback Eli Snyder threw two touchdown passes, both to Crescenta Valley receiver Jordan Lobianco. Muir defensive back Brian Reyes had two interceptions, one of them he returned for an 82-yard touchdown in the second half to give the West a 31-7 lead. It was part of a dominant effort by the West defense. The West lead 10-0 at halftime thanks to a 38-yard field goal by Montebello’s Enrique Lozano and a 22-yard touchdown pass from Snyder to Lobianco. Reyna hit UCLA-bound Monrovia receiver Octavius Spencer on a 53-yard touchdown pass and it was 17-0 early in the third quarter. The East got a little momentum after a turnover lead to a 1-yard touchdown run by Bonita’s Angel Verdugo. Another West turnover gave the East more hope, but the West clamped down and didn’t allow any points. Snyder’s 27-yard touchdown pass to Lobianco on the ensuing possession made it 24-7. The East tried to answer and was driving when Reyes made his second interception of the night and took it back for a score. La Mirada quarterback Christian Lara hit Pomona’s Manny Luna midway through the fourth quarter to close out the scoring for the East. San Marino 4, La Canada 0 — Kelly Crowley had two assists and a goal to lead the Titans to a shutout victory over La Canada. Brooke McCloskey scored twice for San Marino and Zoe Chang scored the other goal and Mandy Hsu had an assist. Marlena Martinez had five saves for the shutout. La Canada’s Kaitlin Corral had 10 saves. Flintridge Prep 55, Pasadena Poly 21 — The Rebels blew out the Panthers (7-9, 5-2) for their eighth consecutive Prep League victory. Tala Ismail scored 15 points for Flintridge Prep (17-1, 8-0), while Lacy Coan and Renae Tamura each added 13 and 12 points respectively. 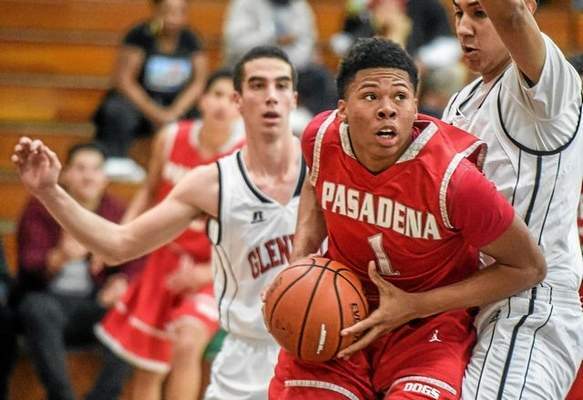 Kiki Yan and Sarah Johnson led Pasadena Poly in scoring with seven points each. Flintridge Prep 6, Rio Hondo Prep 1 — Tim Treinen scored twice and Riley Jones, Jack Enzminger, Aidan Boyle, and Tim Bates each scored a goal for the visiting Rebels (8-6-3, 3-1-1) in a Prep League win. Pasadena 8, Hoover 3 — Goalie Micaela Hammond had 11 saves and Aria Hueso and Irma Sarac each scored twice to lead the Bulldogs (8-10, 2-3) to the Pacific League win. Yesenia Marin-Acosta, Eva Child, Sophia Kownatzki, and Sophia Cimino each scored a goal for Pasadena. 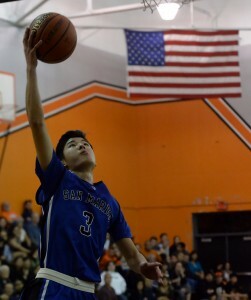 SOUTH PASADENA >> The Rio Hondo League is certainly a shooter’s league. Three-pointers or seemingly nothing. The San Marino High boys basketball team found the mark and South Pasadena did not on Wednesday night and the Titans made sure the first round of league play finished in a bottleneck after the Titans scored a convincing 53-37 road victory.